Sky Sports News reporter and presenter Fraser Robertson has died at the age of 47. The news shocked the world of sport, with tributes from former colleagues pouring in. 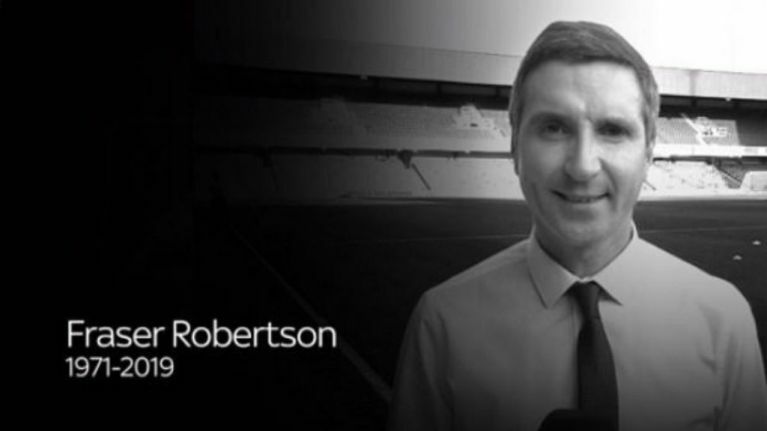 Sky Sports' Bryan Swanson led the tributes, describing Robertson as "an inspiration." "Gutted we have lost Fraser Robertson at such a young age. A journalist with integrity, enthusiasm and who cared passionately about Sky Sports News. Rest in peace, Fraser, you were an inspiration," he tweeted. Former Newcastle, Manchester City and Ireland goalkeeper Shay Given also expressed his condolences via Twitter. Adam Leventhal, another well known Sky Sports journalist, tweeted: "So sad to have lost Fraser Robertson so young. A journalist always committed to the cause, digging and eager to get the stories. Full of energy off camera too and on the golf course. Thoughts with his family at a terrible time." A touching tribute from Robertson's oldest friend in journalism, David Tanner, encapsulated the sadness that so many are feeling at this time. "I’m heartbroken that Fraser Robertson, my oldest pal in journalism, has died," he said. "We met at Napier Uni as kids and grew up together at STV & Sky. He’s always been there, always wearing that big grin. A fine journalist with an eye for a story, never happier than when offering help to teammates: generously sharing his time, vast knowledge and ideas. Fraz loved sport & TV, working in both gave him structure in life, especially after his comeback from major illness. We’ve lost a lovely man. I can’t believe he’s gone and I’m so terribly sad for his family." I’m heartbroken that Fraser Robertson, my oldest pal in journalism, has died. We met at Napier Uni as kids and grew up together at STV & Sky. He’s always been there, always wearing that big grin. "I’m so sorry to hear this David. He was a lovely man and a big part of those early SSN days. Thinking of you x." Desperately sad, and he was a bloody good journalist David.